The question I am asked most frequently is how to hit the ball farther. There have been many theories over the years on how to increase distance: longer backswings, more leg drive, more wrist hinge, etc. Yet all of these are effects, not causes. If you want to know how to possibly hit the ball farther, continue following the aforementioned theories. If you want to hit the ball farther, guaranteed, continue reading. Theories on hitting the ball farther vary, because different things work for different types of swings. Going through the trial and error process could take you a lifetime, and still there is no guarantee of increased distance. Players who consistently hit great distances share some commonalities. Through continued research and over 30 years of data, the three common denominators are: center face contact (CFC), flexibility and strength, and greater axial shift. Let’s take a look at each one. Without hitting the ball in the center of the clubface, you will never be able to reach your full distance potential. For every quarter inch you miss the center, you will lose up to three percent of your total distance per club. For a drive of 250 yards, that is a loss of 7.5 yards. Miss the ball by a half inch, and you lose up to six percent of total distance (or 15 yards). Get the picture? You get better CFC by having a more efficient swing, which comes through better mechanics and properly fit clubs. An efficient swing happens when you are swinging properly and there is no loss of energy transfer from body to club to ball. If your clubs are too long/short, too stiff/flexible or have incorrect lie angles, you could be making adjustments to your swing that inhibit CFC. Attempting to swing faster will not only cause you to mishit the ball more often, it will actually slow your swing down due to more tension and less efficiency. Remember: it’s not how fast you swing; it’s how you swing fast. Flexibility allows you to achieve an efficient swing by not having to force your body into the positions the swing requires. You can achieve a bigger, wider arc with less effort, which ultimately allows you to reach maximum speed during the swing. If you are tight in the hips or back, you will compensate in other areas to make up for inflexibility. Once you start making compensations, your swing’s efficiency becomes inhibited and CFC becomes extremely difficult. Strength is what allows you to hold positions in the swing once you have the flexibility to get to desired positions. Without enough strength, your body will move around like a willow in the wind. A physically stronger golfer will also be able to achieve CFC more readily. For example, if a swing is a quarter inch off where it should be coming into the ball, a stronger golfer will be able to hold the deficiency to a quarter inch, whereas a golfer with limited strength will slip to a half-inch deficiency. As mentioned, that extra quarter inch could mean the difference in carrying a bunker or water hazard. Axial shift refers to the amount of shift (or distance) your spine has moved from the top of the swing to impact and beyond (pics 1 & 2). Golfers who have limited to no axial shift have difficulty generating enough energy to hit the ball farther. The more axial shift, the farther you can hit the ball, because of the greater amount of torque placed on the arms during the downswing. Five types of torque are placed on the arms during the course of the downswing. This torque and energy moves into the shaft (this is why it is so important that the shaft flex and frequency are fitted to you) and ultimately into the ball. This is where potential energy is converted into kinetic energy and passed from the club to the ball. If you limit your axial shift, you are limiting your body’s ability to create more energy. 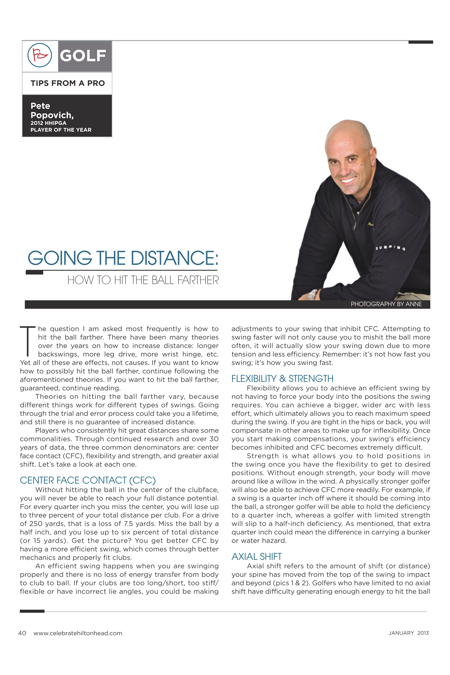 These three ways of achieving more distance are common to all golfers who hit the ball long distances. If you look at the longest hitters on the PGA Tour, you will find their longest shots occur when they hit the ball closest to center of the club head. They are all strong yet flexible enough to have a bigger range of motion; and they all have a large axis shift away from and back to the ball. If you are looking for a better illustration, watch any of the long drivers at the Long Drive National competition. They all employ all three elements above when attempting to hit the ball 400 yards or more. I cannot promise that you will go from hitting the ball 240 yards to 300+ yards. However, I am certain that adding these elements to your game will increase the distance you hit the ball. For more information, call (843) 338-6737, e-mail pete@golfacademyhiltonhead.com, or find me on Facebook at Golf Performance Academy-Hilton Head.